Today, Chilcote guitarists enjoyed performing for their families, playing pieces they have learned this term. They all played extremely well in their groups and Nicole, Babar and Lewis played solos confidently. It was great to see the progress they have all made this term- from our September beginners to our `old hands` in Year 6. Thank you very much to Mr Chamberlain for his hard work with all the pupils and to our audience for their support and commitment to their children`s music. A lovely time was had by all on the trip to Cadbury World. The children were really excited and obviously loved eating chocolate! We started the day with a talk about the Aztecs and the Mayans and how chocolate was an important part of their culture. Then we toured the factory and went on the Cadabra ride but the best of the day was clearly the trip to the 4D cinema - the children loved it! On Thursday 8th November the Chilcote mixed netball team played their third league game against Cedars academy. In the first quarter, Chilcote started really well and quickly went 2v0 up. Then, Cedars started to come back into the game and got it back to 2v2. Just before the end of the quarter Chilcote made it 3v2. In the second quarter, the game continued in the same vain with some excellent end to end netball. Cedars scored to make it 3v3 before Chilcote scored to make it 4v3. Both teams had other chances but failed to take them. The third quarter was the most frustrating from a Chilcote point of view as they spent the majority of the time camped in Cedar’s third and had six good scoring opportunities. Unfortunately, they failed to take any. Cedars did have a few attacks and managed to score on one of these to tie the game at 4v4. In the final quarter, the game was again very even with both teams having many opportunities. Both teams scored a further 2 goals to make the game end 6v6. A great game that was very even. Well done to all of the children involved!!! On Tuesday 13th November six children from Year 6 represented the school in a mixed hockey tournament. The eight teams were split into two groups. Chilcote played their first game against Hollywood B. They dominated the match and had lots of chances but only managed to score 1. This was enough however to give them the 1v0 won. In their second game, Chilcote played against Yardley Wood and the same happened as in the first game that they had lots of chances but only managed to score one goal. Still they won 1v0, which was great! In their third and final game Chilcote played against The Oaks A. The game was much more even to begin with. The Oaks then started to take control and scored with their first shot. They then scored 2 more so Chilcote lost the game 3v0. This meant they finished in second place in their group so went through to the third and fourth place playoffs, where they played The Oaks B. The game was a tight affair with both teams having chances. The first two clearcut chances fell to Chilcote but they didnt take them. Shortly afterwards they did find the back of the net and scored the only goal of the game to win 1v0. Therefore, they finished in 3rd place overall. Well done to all of the children involved!!! Remember Remember the 11th of November. In Year 6 we made poppies to respect and to remember the people that died in the Great War of 1914-1918. We discussed the poem In Flanders Fields and we learnt why we wear poppies. It is because they were the first sign of life on the battlefields after the war ended. We learnt that the money from the sale of poppies through the Royal British Legion goes to the families of serving soldiers and those that have lost people during wartime; it may also go to veterans who have served our country's forces bravely. As a school we have displayed our poppies in a '100' memorial sign because it has been 100 years since World War I has ended. Labels: Community, History, PSHE, Year 6. Today Year 5 said ‘Thank you’ to war poets, photographers and artists as we commemorated 100 years since the end of World War One. We started our day by making poppies that we tied to the cage outside in the playground. We had a look at the photographs taken by Ernest Brooks, who was an official photographer during the First World War, and created our own silhouette paintings in a similar style to one of his most well-known photographs. 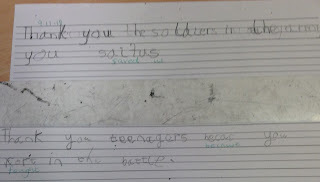 We read some poetry and learnt about some of the most famous poets who fought during the war. 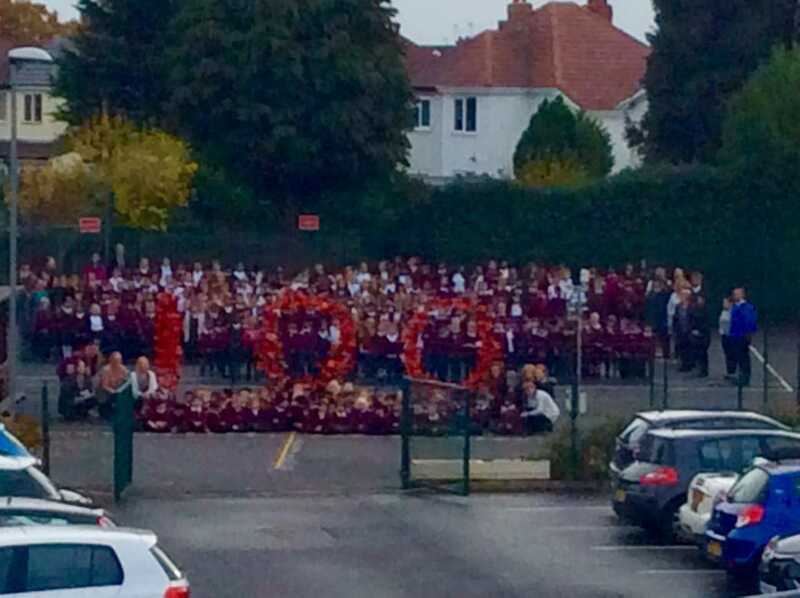 The whole school went outside to have our photo taken with the poppies we had made and ended the day with an assembly led by Mrs Doherty which encouraged us to reflect on the war and the impact it has had on us today. 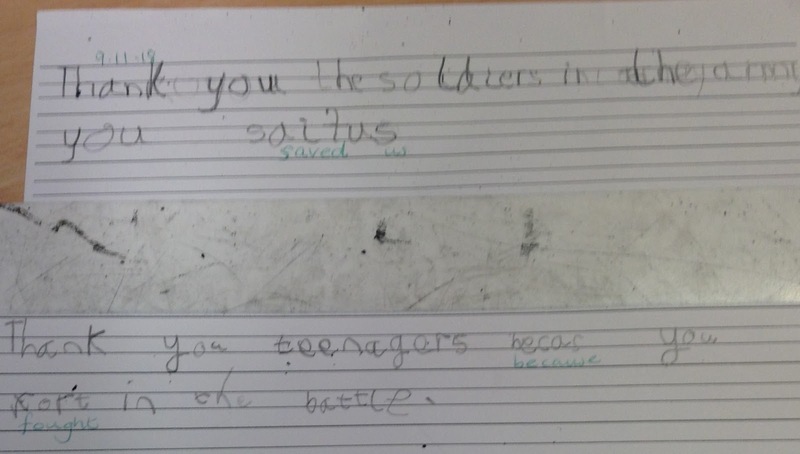 Today we learnt all about the children who sacrificed their childhoods during World War One and tried to help the war effort in any way they could. 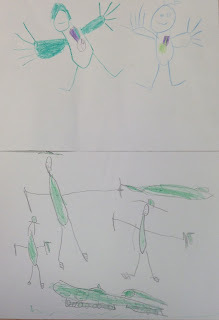 We were amazed that some children gave their money, their time and even put themselves in danger to help the war. In particular, we were fascinated to discover that Boy Scouts and Girl Guides were running during the war and still run now! 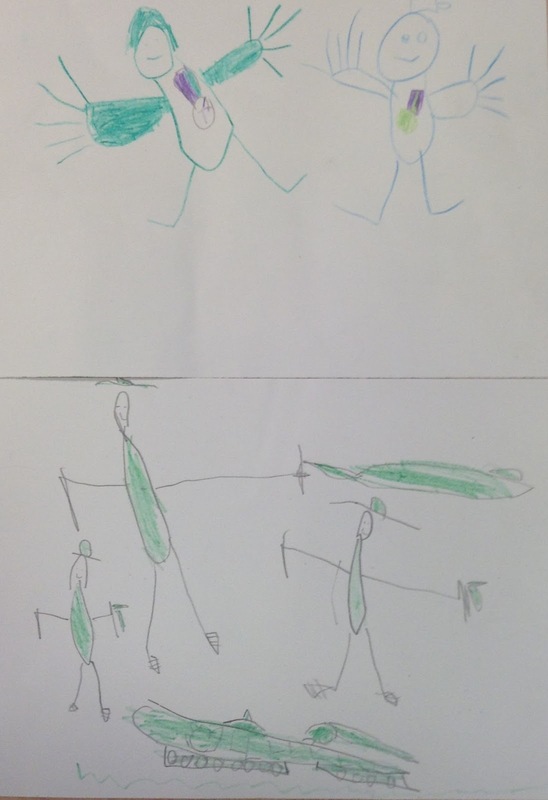 We looked at lots of different photographs and tried to decipher what the children in the images were possibly doing. We were very surprised to find that children played such a major part at home whilst their parents went to fight on the front line. To commemorate those who sacrificed their lives, we made poppies in class which were used to make the number 100 on the cage. This was to signify 100 years since WW1 ended. We used four heart sahpes, a black circle and a leaf template to make our poppies. The whole school made poppies and these were tied to the cage in remembrance. We then had a photo taken in front of them. We felt it looked amazing! We also had a class photo taken in front of the art to remember our day and the people who sacrificed their futures for our today. Our second poppies were used to create a wreath of remembrance for our middle room. As you can see, year 3 had a fantastic day learning all about the sacrifices that were made and paying our respects to those who did not survive. We thank them and will always remember them! Today we have talked about Remembrance day and what it means. We have made poppies and added them to the whole school display to mark 100 years since the end of WW1. In Year Two we made poppies using tissue paper and we tied them onto the 100. We were remembering the end of World War One 100 years ago. We learnt all about a nurse called Edith Cavell who helped the people who were injured in WW1. We decided that Edith was a hero for helping all soldiers no matter which side they were fighting for. 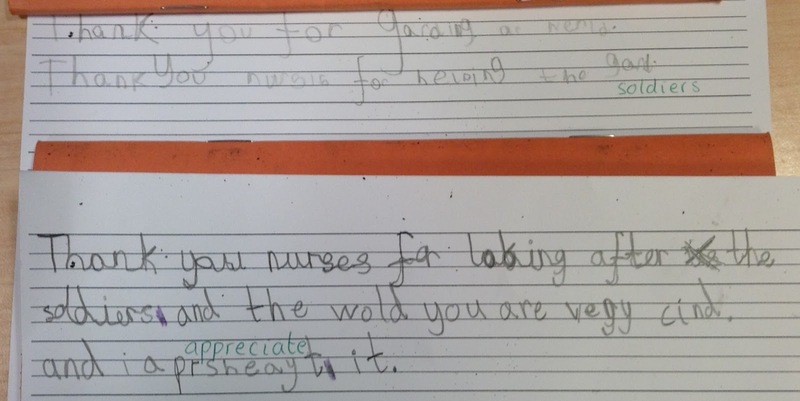 We wanted to say thank you to Edith Cavell and the other nurses and doctors who treated people during the war. On Friday 9th November, Year 1 learned all about Remembrance day. We created some red and black poppies and put them onto the green fence in the playground with everyone else in school- 470 poppies in all. We took a photo with the whole school with the number 100 to remember that the war finished 100 years ago. We learned that the first soldier who died was only 17 and was called John Parr. 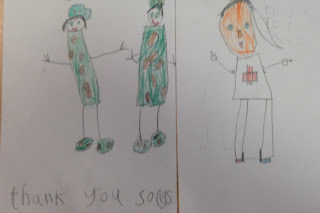 We were learning about the soldiers and nurses in World War 1. We made poppies to hang up in the shape of 100. 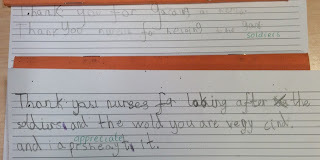 We wrote and drew postcards to say `thank you` to children, nurses, doctors, ladies and men and soldiers for defending our country. We also used our time machine to see what it was like on Armistice Day in 1918.